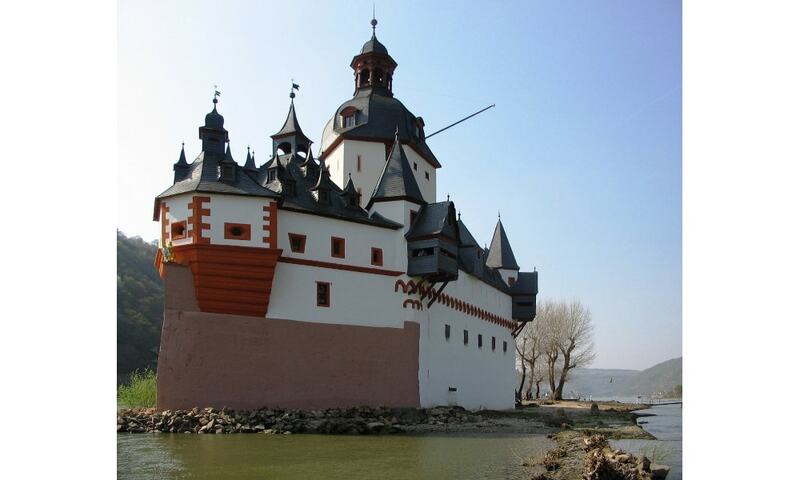 Pfalzgrafenstein Castle is a toll castle on the Falkenau island, otherwise known as Pfalz Island in the Rhine river near Kaub. Known as "the Pfalz," this former stronghold is famous for its picturesque and unique setting. The castle functioned as a toll-collecting station that was not to be ignored. Unlike the vast majority of Rhine castles, "the Pfalz" was never conquered or destroyed, withstanding not only wars, but also the natural onslaughts of ice and floods by the river. The State eventually turned "the Pfalz" into a museum and restored the color scheme of the baroque period. The museum reflects the conditions of the 14th century, and the visitor will not find modern amenities such as electricity or a lavatory. It is accessible to the public via a ferry service from nearby Kaub as long as river conditions permit.